This right here is my absolute FAVORITE summer meal. 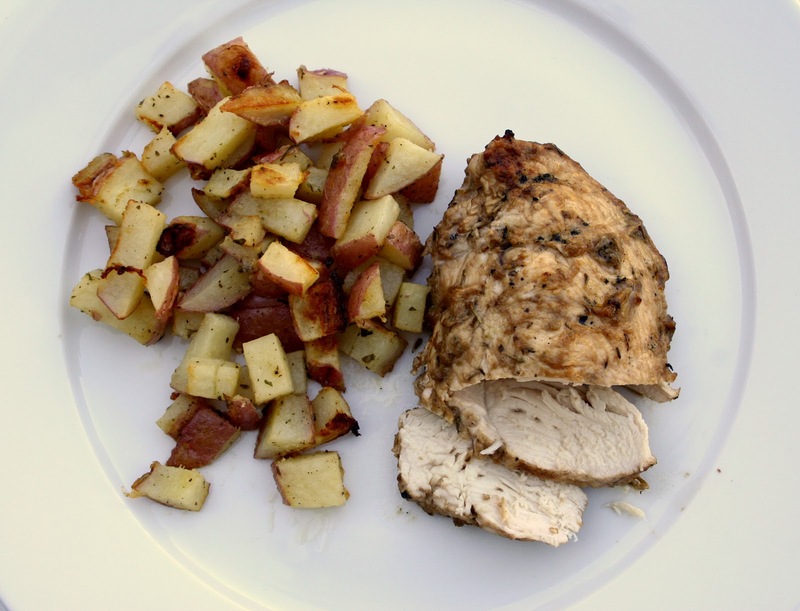 I really just don't think there is anything better and simpler than some grilled chicken and roasted potatoes. This meal comes together in under an hour and you'll find yourself licking the plate. I am just so excited about finding this marinade. Nothing beats freshly marinated grilled chicken on a warm summer night. And those potatoes? They have the perfect amount of ranch flavor, are perfectly crisp and perfectly soft on the inside. I've made these potatoes about 4 times in the last couple of weeks so you could say I'm addicted. 1. 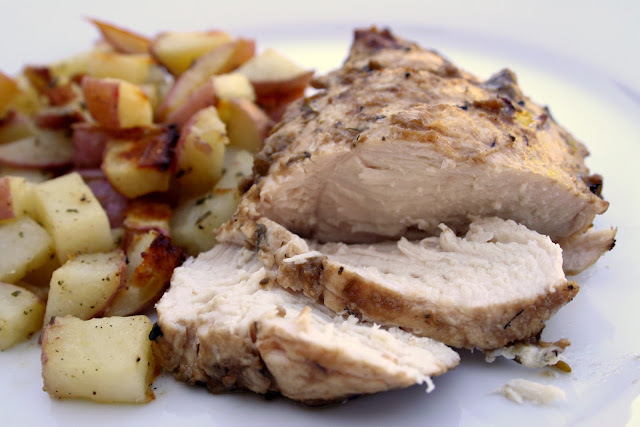 Put the vinegar, thyme, mustard, garlic powder and olive oil in a resealable plastic bag. Close the bag and shake to combine the ingredients, squeezing with your hands if necessary. 2. Open the bag and drop the chicken breasts inside. Seal and let marinade for at least 30 minutes or overnight. 3. Once chicken has marinated, grill over medium-high heat for 4-5 minutes a side, basting with the leftover marinade a few times as it grills. 2. Place potatoes in a medium bowl, add oil and stir to coat. 3. Add ranch dressing mix and stir until well coated. 4. Transfer the potatoes to a baking sheet lined with parchment paper and spread into a single layer. 5. Bake for 35 minutes or until brown and crisp. This really is my favorite meal! I bet your family would love it.